Recumbent bikology in the urban jungle. : When would I be ready for clipless pedals? 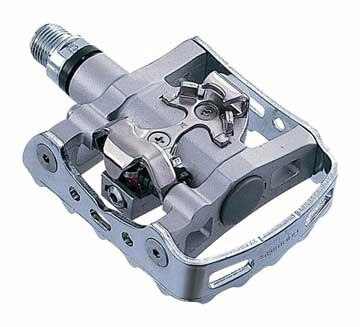 > What are your thought of clipless pedals and recumbents? > have to keep flipping them to the cage side when riding. About half the time, I use clipless pedals (a.k.a., cleats) and half the time I use platform pedals. Usually, for long and hilly rides, and summer training sessions, I'll use cleats because they allow me to apply more power to the pedals. For city riding I prefer platforms because it's easier for me to get my feet on and off the pedals and on and off the ground. I sometimes use "Power Grips" which provide a combination between platform pedals and clips. The primary notes about clipless pedal systems, in order to lessen the chance of accidents caused by being trapped in the cleats, is that the rider should be a) VERY comfortable with the bike, b) VERY comfortable with the clipless system, and c) ready and willing to maintain their clipless pedals and cleats. With cleats, simply, it's harder to get one's feet into and out of the cleats, so one needs to be very comfortable with balancing and steering the bike at all speeds, including at slower than walking speed, (to lessen the chance that an unexpected maneuver will be required). Secondly, once one decides to make the move to cleats, I strongly recommend that one practices -- a hallway is a great place, putting both hands on the opposing walls -- clicking in and out of the cleats, with both feet, numerous times -- a hundred times isn't too many -- before hitting the streets. I also strongly recommend practicing again on the street -- a hundred times for each foot isn't too many. This is what I myself have done, and I still do a shorter version of this each time I use a new clipless system. Lastly, be sure to read the instructions about how to care for the locking system as well as the cleats in the shoes. If no instructions came with the pedals, they're also available on line. At minimum, one needs to keep the locking system (on the pedals) well lubricated and smoothly functioning. And the cleats in the shoes need to be in good condition and not worn down. The primary reason I'm conservative about my recommendations here, and suggest a great deal of practice, is that if one's feet are stuck in the pedals when one loses one's balance, there is no way to prevent falling over -- and that's going to hurt. If it's a bad fall, bones and bikes can break. With bike riding, I always recommend caution, care and safety above all else, especially before speed. The only time I've ever fallen on a bent was while I was wearing cleats and had to suddenly stop. In my case, I got my foot unclipped just fine, but when I hurridly put my foot down onto the smooth concrete, the cleat slipped. It wasn't much of a fall. I wasn't hurt and nothing got scratched, but it was enough to teach me a lesson about being extra careful when I stop. In summary, I use them, but I put in the time for practice and maintenance. I hope this is helpful, K.
It sounds like you're enjoying the bike, K. Keep it up!